WMUK General Manager Stephen Williams interviews Western Michigan University Vice President Tim Terrentine this morning during the on-air pledge drive. 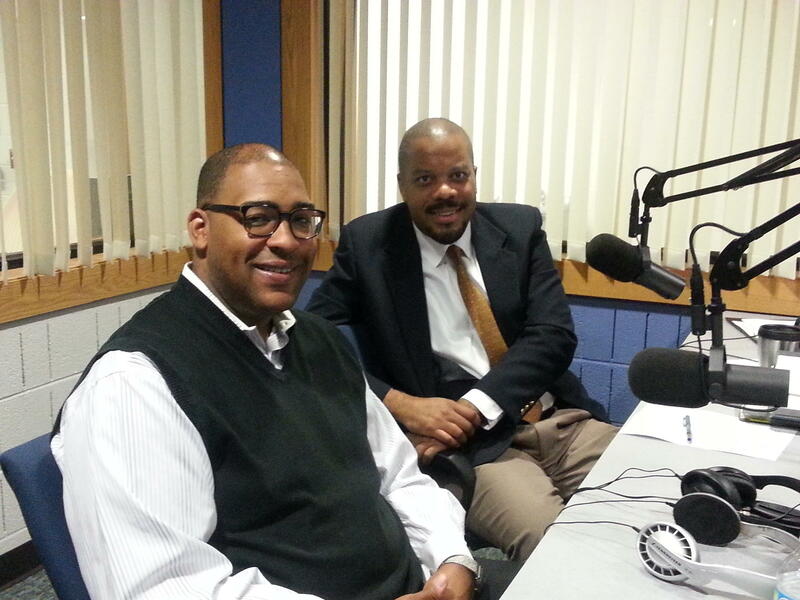 Western Michigan University's new fundraising chief Tim Terrentine made his pledge to WMUK this morning in a live interview with General Manager Stephen Williams, and urged listeners to donate to the fall fund drive, too. "I think public radio is one of those places that remains in America where you can have an elevated dialogue about issues," said Terrentine, WMU vice president for development and alumni relations. "The ability to have dialogue and banter about a topic in a respectful, thoughtful way, unfortunately, is not the norm in our media anymore." "In the messages we receive, we're encouraged to fight, not to discuss," Terrentine told Williams. "We are encouraged to take shots, instead of debate. And I just love the way WMUK and National Public Radio -- and some of the other partners in public radio -- continue to attempt to have an elevated conversation that make sense on the issues that are important to us." In August, WMU grad Terrentine joined President John Dunn's leadership team as a vice president in charge of fundraising efforts through the university's foundation. He oversees alumni relations functions as well. WMUK is a division of Western. It was founded there 65 years ago. Terrentine was most recently executive vice president of Southwest Michigan First, a leading regional economic development organization based in Kalamazoo. Prior to that, he was executive director of the Douglass Community Association, also in Kalamazoo. Terrentine earned his bachelor's degree from WMU in 2004 and a master's degree from its School of Communication in 2006. Williams: How does it feel to be back? Terrentine: "It feels great to be home. I am reminded as I walk around campus as I meet students, faculty, deans and staff all around, this was home for me. This is where I grew up. There is many fond memories. And some of the people are still here. So it's exciting to engage in a different way. And I am excited, of course, to come talk to you this morning. WMUK is a huge part of our university. It's a big part of how excellence is measured at the university." Williams: You are a member of the Board of Directors of the WMU Homer Stryker M.D. School of Medicine. So you keep coming back to the university. Terrentine: "I have learned that....you never know what the next opportunity is going to be. And I really don't spend too much time stressing about it, partly because, if you just try to help people and do well with what's in your hand, my experience has been the next opportunity will come to you. And I have really just tried to be a good steward of my talents and to treat people right and help people where I could." Williams: It might be too early to know, but what general direction would you like the university's foundation to go? Terrentine: "I think it's critically important, first of all, to recognize that we're both development and alumni relations, and so our first customers are the Broncos that are here today, that will be alumnus soon. They will be the people giving back to the university in years to come. And so we celebrate our students and our faculty. Our job is go out and tell the Bronco story, to talk about all the amazing things that the students, faculty, staff and administration are doing on this campus, and tell that story in a way that would compel people to want to support their alma mater, to want to support their national university. This is a university that impacted so many people's lives, from foster-care programming to afterschool programs for children to ground-breaking research, ground- breaking engineering, ground-breaking product design, arts. You name it, Western Michigan University is leading ... and so we have to tell that story and build the types of relationships that will garner support for all the amazing and ground-breaking things we are doing on this campus. We are learner-centered and globally-engaged, and so I want to make sure, as a team, that we represent partnership and pride for this university. And the more we can talk about what we do here, the more we can engage with our alums and give them places to come bring their talents to bear back at the university, I think we will see a continued growth and a continued strength of bench at this university in terms of raising money and raising friends and bringing people closer to Western." Williams: What drives your passion for public radio and the station? Terrentine: "I think public radio is one of those places that remains in America where you can have an elevated dialogue about issues. The ability to have dialogue and banter about a topic in a respectful, thoughtful way, unfortunately, is not the norm in our media anymore. In the messages we receive, we're encouraged to fight, not to discuss. We are encouraged to take shots, instead of debate. And I just love the way WMUK and National Public Radio -- and some of the other partners in public radio -- continue to attempt to have an elevated conversation that make sense on the issues that are important to us. In times like these, we need sources where we can have dialogue, where can have conversations where people don't want to run from the conversation but they want to engage. I know how much we need that in society today, which is why I support public radio." Williams: Any advice for listeners who are on the fence about giving? Terrentine: "Well, I guess to put it plain - get off the fence (he laughs). This is an opportunity for us to not only support radio that helps inform us, that keeps us informed of what's going on the world around us, but it gives an opportunity for the university to be engaged in that process, to talk about what's going on at Western Michigan University, to talk about what's going on in our local community. As we all know, it's getting more and more difficult to get news on local things. WMUK is here for us. We have to support that. And if we want the quality that WMUK provides, I would hope that we would support that quality -- and I'm in this year. My wife and I are certainly going to support, again, your work this year. We're just happy for what you're doing here. I would encourage all others, even if it's only a small gift. We elected a president $25 dollars at time. We can certainly meet WMUK's expectations this year." Earlene McMichael transcribed this interview.